Please note that this post will contain spoilers for some things. Namely, Twilight, Lord of the Rings, and Tuck Everlasting. I’m assuming that if you don’t already know what happens in these stories, it is because you either never cared to find out or intentionally avoided it (cough-Twilight-cough). But you have been warned! You may be relieved to know that Breaking Dawn was so bad it brought me to my senses about the whole enterprise. Although Edward and Bella’s obsessively unhealthy relationship was somehow tolerable (even, I hate to admit, romantic) to me up until that point, Bella deciding to forgo her mortality to become a beautiful and perfect immortal being, just so she could spend the rest of forever with her boyfriend, was the last straw. Being a fantasy and sci-fi fan, I have come across my fair share of immortal characters. Enough to have an interest in thinking about the idea of being immortal as it would play out practically and philosophically. Enough, also, to know that immortal characters almost always have a host of psychological complexes and are generally not very happy people. The Cullens are compared to rocks often in Twilight. They’re cold and still, like stone or marble. There’s some nonsense about how vampires change so little that, prior to Bella, Edward had never loved anyone. And now that he loved her, he could never change again not to love her. One change, in an endless lifetime of permanence in an ever-changing world. It’s depressing just thinking about it. Winnie Foster is a young teenager who lives a very sheltered life. One day she escapes out into her family’s woods where she sees a boy drinking from a spring under a tree. This boy is 17-year-old Jesse Tuck, and it turns out he, his parents, and his brother all drank from the spring 87 years ago and since then have been unable to die. They take Winnie in for a while as they explain their secret, and she grows to love them, and they her. And she of course has a particular friendship with Jesse, the mysterious immortal boy who introduced her to this exciting new world (see where I’m going with this?). The Tucks end up having to leave for various reasons, but Jesse gives Winnie a bottle of the spring water and tells her to drink it when she’s 17 and join their family. Forever. It was clear as soon as Winnie found out the truth about the spring that she had a choice ahead of her. She can choose to live forever, which would seem great to some folks (which is consequently the main conflict in the story, as some people want to use the spring for greedy purposes), and stay with Jesse and the family she has come to love. Or she can go back to her other life, and grow old and die. But despite the confines of her old life, she could never be stuck there the way the Tucks are, “rocks beside the road,” while everyone else travels on. Winnie chose to die so that she could truly live. Which brings me to Arwen, who’s situation is perhaps even more similar to Bella’s, although unlike Bella she starts out as a beautiful, perfect immortal being. Arwen and Aragorn also have the whole love-at-first-sight thing going for them (although personally I think Edward and Bella’s little romance is child’s play compared to this one. I don’t see either of them becoming king of the world or having songs written about them.) and with such epic lovers as Beren and Luthien in both their ancestry, naturally some major drama was bound to go down in their relationship. Or so we can assume. 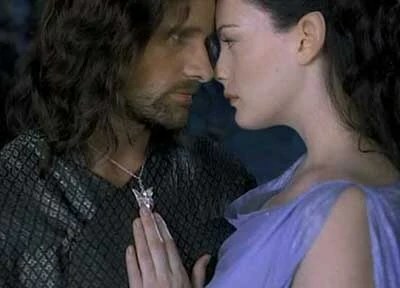 From what we know (in the books, and I think much more kindly of Arwen’s representation in the movies these days), Arwen decided to drop her immortality with minimal hesitation once she fell in love with Aragorn. She loved him so much that life without him would be meaningless. Like Bella and Edward, it’s a lofty, grandiose type of love that may be difficult for us mortals to empathize with. But unlike Edward, Arwen was willing to die for that love. Bella and Edward get caught up with the details–what about when Bella gets old? It’ll be weird for her to be with a 17-year-old. And she’ll be gross if she’s old anyway, what if Edward doesn’t like her anymore? Her insecurities are so intense, I wonder if Bella’s motivation, without her even realizing it, is her own fear of death. I do believe that Bella made the wrong choice. Twilight was all about a relationship that was supposed to make me want to be in that relationship. Edward was so perfect and gentlemanly and hyper-romantic, and yet their interactions were so intense and passionate. It was everything a girl could dream of, right? Okay, if you ignore how weirdly jealous-magnetized-obsessive the two were, then maybe. But I would never, ever want to be in a relationship that made me so crazy I gave up the one thing that allows my life to be real, and interesting, and full, i.e. my ability to die. Our impermanence is the only thing that makes what we do during our lives matter. Even if Bella was magically able to overcome all of the usual obstacles of becoming a vampire and immediately be perfect and beautiful. Even if at the end of the story she loves Edward, and is looking forward to spending forever with him. In the end, she’s gone cold. There is nothing left for her to become. Team Bella Needs To Learn To Live Without A Man! Awww, I love Tuck Everlasting as the Anti-Twilight. Beautiful. Immortality is boring! And Twilight is stupid, lol.